Out of all the emails I receive in regards to budgeting for travel plans backpacking Australia is without a doubt the place people are most worried about or needing information on. With their ever strengthening economy it’s not the cheap backpacker country it once was and it’ll take up a large chunk of your budget. With most places I usually say around £1,000 per month (my monthly budget for Thailand was even less!) will leave you with plenty of cash to splash…backpacking Australia though (and I hate to be the person to break this to you!) will be nearly double that. So How Much Will you Need To Budget For Australia? As one of the biggest destinations on the planet backpacking Australia comes with a wide variety of accommodation – whether you’re looking for hostels, hotels, boutique spas or even couch surfing there’s something for everyones taste. I’m guessing most of you will be hitting up hostels (as they’re the most budget option) so I’ll focus on that. Australia is pretty expensive when it come to eating out – so if you’re on a budget you’ll want to mix it up with a good bit of home cooking. Saying that though many hostels offer some great backpacker feeds (like Sydneys “Wakeup”) for around $5 and there’s plenty of backpacker bars (like Byron Bays “Cheeky Monkeys”) which do the same, so you can grab a budget feed on the go too. If you’re going out to party again the backpacker bars are the way forward and many of them (like Woody Surf Shack in Byron Bay or The Woolshed in Cairns) offer a whole host of giveaways and competitions, from surfboards to dive courses, so you make your night out well worth the money! 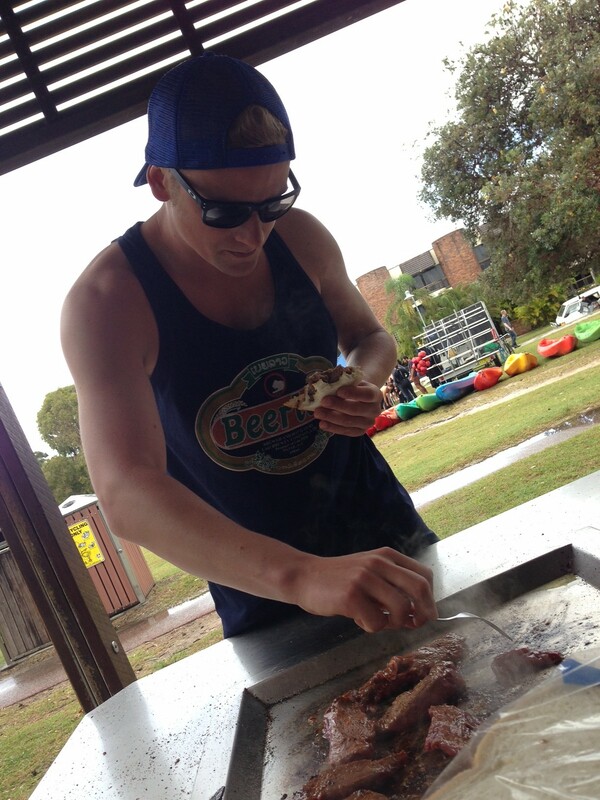 Nothing Beats a Beach BBQ! Favourite dish – Beach BBQ’s! Favourite place to eat – hmmmm…this is a tough one as I try to cook myself whenever possible in Australia to save my budget! Australia has a pretty solid travel network that’s easy to use, book and get to pretty much everywhere – from low cost airlines and campervan rentals through to backpacker hop on hop off bus passes. For the purpose of this break down I’m going to concentrate on the East Coast route – which is the most common route for backpacking Australia and has the most option in terms of bus transport. Unfortunately as beautiful as the West Coast is you’re limited to Campervan hire and tours on that side of the country. Here’s a couple of the main journeys you’ll want to make and how much they’ll set you back. Greyhound WHIMit Pass (only restricted by time frame not route) – $249 (7 days) up to $1499 for an entire year! If you’re only backpacking Australia for a month I’d say Sydney – Cairns will be your route and the hop on hop off Oz Experience or Greyhound Bus Pass would be the most cost effective way to achieve this. You’d potentially add in a single flight from Cairns to Sydney for an onward flight or a brief stop in Melbourne and fly to Sydney to save time. If you’re not sure on how to travel the East Coast check out this blog post. 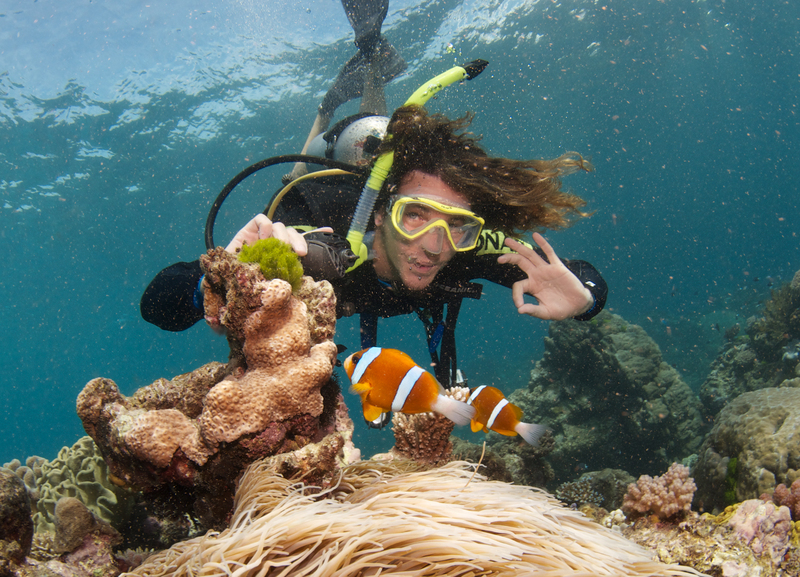 One of the biggest draws of backpacking Australia is the amount of epic activities on offer! The East Coast is rammed from top to bottom with loads to do – from day trips to learning new skills you can pretty much do anything from skydive to kayak! If I had to pull out what the average backpacking Australia trip would include over a month I’d say you’d be hoping to do most of the above, maybe excluding your PADI, Skydive, Great Ocean Road Trip and Sydney Bridge Climb. This budget for backpacking Australia includes accommodation, meals, transport and the main activities as listed above. I’d like to point out though that this is merely a base point for your budgeting though and it’s always best to over compensate when it comes to money as it’s very much a personal thing – and of course you’re drinking will add some dollar on top. This 4 weeks would allow you to pretty much cover the whole East Coast Australia backpacker trail and you’d be packing in all the main sites and things to do – including spots like Byron Bay, Fraser Island, Whitsundays, and Cairns. Some people will easily spend less than this – especially if you’re on a years working holiday visa and pacing yourself up the coast, or simply have longer to spend on your trip. And also keep in mind the longer you’re travelling for the more spread out your bigger costs will be (like tours and bus passes) so your daily spend will obviously be lower. But if you’re pushed for time in Australia and want to do pretty much all the bucket list ticks it’s all parcelled into the above summary and 4 weeks is the ideal amount of time to spend on that route. You can also customise your own East Coast package to suit your personal time frame, budget and preference. Even though it cost more than places like NZ or Thailand I totally recommend you visit there. It’s an amazing place to explore and is still one of my favourite countries on the planet to travel to. You can also save heaps with some awesome East Coast Australia Package deals which bundle in accommodation, tours and travel passes to help you save. So check these East Coast deals out – you can even tailor them even further to suit your times frames and budget. Found this post helpful? Check out my other How Much To Budget Posts! Or let me help plan your Aussie Adventure with my East Coast Australia Trip Planner! How much did you spend backpacking Australia and what was your original Australia budget? Cheers Christine – looks like I’ll have to search through your site for some more bucket list items hey?! Glad you agree that it’ll help backpackers heading that way – did you have fun there? Really useful tips, thanks! I’ve been in Oz for 6 months now, so I have a pretty good idea of the costs, but it’s good to see it all broken down and added up again. I agree, it’s probably worth it. What I’ve seen of the country so far has me eager to explore as much as possible. Next on my itinerary: Byron Bay! It’s totally worth it Arianwen! Anything you’d add to the breakdown that other travellers may find useful? This is the most useful thing EVER. I’m going in Sept and this is overall pretty much what I had planned – and I know I’ll have plenty of money to do this and more (bungee jump definitely being added to that list!) without having to worry too much as I have really over-compensated for the fact I’ve heard Oz is so expensive. This has taken the worry off a fair bit now- and I’ve got a WHV so will be able to top up money with other travels as well as you can earn such good money. I’m so glad you do these blog posts – thank you! Stoked that it’s helped you out so much and put your mind at rest. Obviously you can make things heaps more expensive if you choose but I’d say it covers the main points you’ll need to spend for. And indeed your WHV will definitely help you heaps, I’d look into work for accommodation too. Cheers to you and keep going! hahahaha sorry to distract you for so long Christina – let me know if you get lost!hahaha! I never normally comment on blogs but i just wanted to say THANK YOU!! we’re heading off on our RTW trip soon and were getting a bit worried about the cost of Oz but this pretty much sums up exactly what were planning to do so it seems doable! these blogs are a great idea! awwww that’s no worries Gina – stoked it helped you out and has put your mind at rest! Enjoy Australia – you’ll love it! 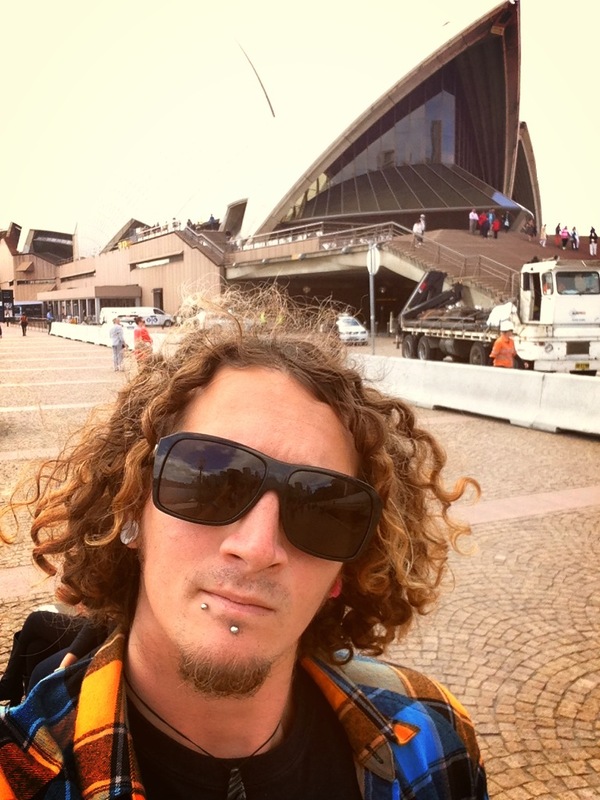 Hey Terrain – stoked to hear you’re heading to Oz! All those prices have been converted over to £GBP, so it’s roughly double for $AUD at the moment. Glad to see you’re prepared and you’re giving yourself enough time to save – I hope you have an awesome adventure…Oz and NZ are heaps of fun! Good times Maggie – I hope you have an awesome trip! Let me know how you get on. I’ve been reading your reviews for some time now, extremely helpful! I thought I’d go for it and ask you about my finances for my east coast trip from the 16th Nov to 13th Dec would really appreciate the advice! Roadtripping it from Cairns to Sydney, car has been paid for along with hostels in Cairns/Sydney. Inbetween we are going with the flow. I’m taking £5,000 this will cover petrol, food, booze, activities and hostels. My main question is – Will this be enough money? I obviously want to do the main activities, any help would be amazing! If you manage to burn through £5k in a month simply on petrol, food, activities and hostels I’d be very surprised and you’d be terrible and budgeting!hahahaha! Seriously though that should be more than enough. If you check out the budget you can do all the key things for under £2k all in – your fuel isn’t going to add crazy amounts to that figure so as long as you keep your personal spending and meal costs under control I’m sure you’ll be fine. Just thought I’d say how useful this was in prepping my Oz trip for a month over Dec-Jan….just counting down the work days now. So keen its unreal! Appreciate the helpful other articles! Safe travels. Stoked that you found it useful Smirnoff – let me know how you get on! Thanks for the tips Chris, I’ve been looking for something like this post for a while now! I’m heading out to Sydney for the new year and then will be making my way around oz for 2-3 months. Presumably that’ll bring the monthly cost down a bit by spreading transport, big activities etc? I was hoping around £40-50 a day if I’m careful. Spot on Craig – if you’re spreading the big costs – especially transport it should reduce your budget. Your big spends will then be food and accommodation, which depends on how you eat and sleep! Let me know how you get on! Thanks for the tips Chris! This is so useful, I’m going to Australia with about £3000 so at least I know I’ll need to find work within the first couple of months! Thanks! No worries Aleesha – let me know how you get on…and have an awesome time! This has helped so much, thank you! I was trying to find out how much to take, how to budget etc. and then came across this. Life saver! I’m off to Australia for 2 months in February and I’m so excited, it’s ridiculous! Fab blog, it’s definitely my favourite now! Stoked that the post helped you out! Have a blast in Oz and let me know who you get on! I’m actually in Byron Bay in Feb for a couple weeks, if you’re around for a beer let me know! Hope you enjoy it Katie – let me know if I can be of any help! Good luck with the saving – it’ll be totally worth it! This blog has been has been an incredible help in planning my trips. Im off to Oz the middle of February. Thanks for your help and insight! No worries Thomas – glad it helped you out! Whats your plan? Stoked to hear you got it under budget Jasmina – couch surfing is a solid shout to save whilst on the road! how long were you out there for and anything you’d recommend I add into it? When you heading to Thailand? This was really helpful. Im starting in Sydney in 12 days time and hoping to be there for a year or longer. Im in no rush to travel up to cairns but want to do it all! obv i know i will need to work probs after a month or two. Whats the best way to travel? stay in hostels and then greyhound it up? or campervan? Campervan wise if you have the cash it can be a great option (I did it myself) however if things go wrong with it it can ruin your trip too! Many of the key spots you’ll need to book into a campsite anyway so sometimes the buses are the most hassle free option! Hey Chris, I was wondering whether you could help me? I’m looking to go Oz and want to do the east coast, but not sure whether it would be cheaper to book the grey hound bus and then pay for the trips when I’m out there like whitsundays and fraser island or would it be better to do the Oz Experience which includes the trips? I’m going to get a working holiday visa as well so would probably want to travel first and then go back to somewhere to try find work.. Is that the usual thing to do or would you say to work whilst travelling up? I actually jus put up a post about this which is worth checking out! If you’re on an Oz working visa I’d go for the Greyhound KM passes as they have a longer validity that you can also top up along the way too. This means you’re not on a timescale and can go with the flow a bit more. You can then book your Fraser Island/Whitsundays trips en route. In regards to work/travel it depends on how much cash you have saved really and where you want to work. I’d maybe do a little trip (say fly into Melb, do the great ocean road then travel to Sydney) so you have a little adventure before topping up the funds, but it comes down to how far you’re money will go really. Thanks Chris, that’s really helped! Think we will go for the KM passes! If we wanted to go from Sydney – Cairns what pass would we need? Not sure on how many km that will be… Would the 2500km cover it or would we need to get the 5000km? I came across your website as I am researching a trip around the East Coast of Oz for about a month. You’ve got some really useful tips so I definitely need to read on more but quick question, do you think 4 weeks is too long to spend just in Victoria and NSW? Hi Chris, Great blog glad i stumbled across it! Cheers James – stoked you like it! Personally your plan to start working straight away is a solid shout and what I’d do, that way you have a even more savings to play with and can enjoy the Aussie summer even more! If you’re already planning NYE in Sydney I’d get that booked as quickly as you can because hostels book out super early in the year – WakeUp Hostel is where I stay, great place and super central! So glad you said that. Would never of thought about booking in advance. I’d been pretty gutted if every where was full and i couldn’t see in the new year in Sydney! Where you recommended is fully booked up, as is a lot of other hostels for NYE. i managed to get a reservation at Surfside coogee beach hostel. Amazing blog, sobglad I came across it. I and a mate are planning a trip to Oz on 1st Oct. 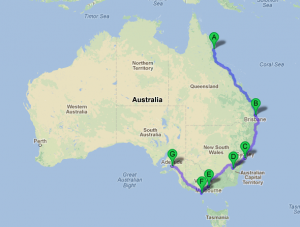 The plan is to start in Cairns and campervan along the east coast to Melbourne where we will stay for a while before heading to Perth. We want to stay over in Sydney for NYE. Do you think Oct to Jan from Cairns to Sydney is too long? Any advice would be great! Stoked you’re loving the site! To be honest the longer you take on the East Coast the more you’ll enjoy it! Are you looking at working at all? A lot of it will come down to budget and what you’re doing along the way. 6 weeks is the minimum I’d really recommend to take so you’ll have plenty of time to chill and soak it all up! I love travelling Oz Louisa – it’s a shame it is a bit more expensive but I still think it’s totally worth doing…in fat I’m living in Byron Bay at the moment! Hi, thanks for your tips! I’m coming to Australia for a year on a working visa and plan on spending the first months working and living with my relatives. I then want to do an East Coast backpacking trip and then go on the New Zealand/Asia. I’m worried I will have too much luggage with me to go on the buses/stay in hostels. Would you recommend leaving the majority of my stuff with my family and getting them to send it back to the UK? I don’t know what the best way would be. Hi really good article you wrote! Great tips gonna use them to planning for my trip to the east coast, i’m traveling to oz in about three weeks! :) I will check your other blogposts to! No worries Adam, stoked they helped! Enjoy Australia, heaps of fun! Hey Zequoia, jealous of your Kiwi passport! Personally the more dollar you can take to Oz the better, but given your passport situation I don’t see it being an issue picking up work pretty easily! We’ve travelled on east coast in 2011. We had a car, slept in tent in camping’s, between the camping-holiday parks are very good equipped, you can cook by yourself. so I don’t see any reason to be in hostel/hotel in such nice weather in Queensland. We also took 2x day trip to coral reef. I campervanned a lot of it the first time I was there and loved it! Depends if you want to meet heaps of travellers and how you’re making your way along the coast I guess! Stoked to have helped you out Julia – let me know when you’re heading this way! Thanks this is a really useful post! I’ve been trying to figure out when to move to Australia based on money and this was super useful! What month would you suggest going to have the best luck getting a job? Awesome post! i really like your budget travelling posts. Many people think travelling is very costly (sometimes can be), but with proper budgeting, it isn’t really hard to save up! Indeed it’s a case of being prepared. Yes some countries (like Oz) are more expensive, but it depends how you’re mixing them up and spreading out big costs. Thanks for this! If people realized how much money they throw around each month, they’d see just how easy it is to save up for a super awesome trip in Australia. I was working on a visa in Australia and for a few months I saved up quite a bit to have an amazing trip in Nepal for 6 weeks.